Delivering a truly unique itinerary exploring the exotic destination by mega-yacht, itineraries will depart directly from Havana or Cienfuegos and circumnavigate the western side of the island. The 112-guest mega-yacht, SeaDream II, will provide the ideal vantage point to experience the Caribbean nation’s rich, cultural landscape. Trinidad is a town in the jurisdiction of Sancti Spititus, central Cuba, in a preserved Spanish colonial settlement founded in 1514. Declared a World Heritage Site in 1988, Trinidad is the holder of Cuba’s oldest and most captivating ‘outdoor museum’. Charming cobblestone streets bustling with local townspeople, wild donkeys and the sights and sounds of a bygone era. Trinidad has of some of the best beaches in Cuba, with Playa Ancon offering hiking trails and scenic waterfalls. La Perla del Sur, or “Pearl of the South, is a southern city originally populated by indigenous peoples, and later settled by French immigrants in the 1800’s. The port, very large by the standards of the times, was instrumental in multi-national trade, especially between South America and Jamaica. Sugar was a major export of the city. The city’s Urban Historic Center is a UNESCO World-Heritage Site, and serves as an example of urban planning accomplished during the 19th century by the Spanish. Other attractions include Castillo de Nuestra Senora (a castle/fort), historic cathedrals, botanical gardens, a cigar factory, and the University of Cienfuegos. The capital of the island nation and the most populated at over 2.1 million residents, Havana is the 4th most populous area in the Caribbean region. The walled capital was founded by Spain in the 16th century. The sinking of an American warship in 1898 signaled the beginning of the Spanish-American war. Havana experienced exponential growth in the 1930’s when the city became a major tourist destination, until 1959 when Fidel Castro came into power following the revolution. “Old Havana” became a UNESCO World Heritage site in the 1980’s.Visitors to Havana enjoy colorful displays of culture, architecture, music, and the arts. Known as the “Isle of Youth” or “Isle of Treasure”, Isla De Juventud is the second largest island off Cuba’s shore. Very popular with divers and “treasure hunters”, this island is known for its beauty, history and pirate lore. Discover the idyllic and unspoiled Punta Frances Marine National Park; an excellent coral reef diving location. Beautiful black-sand beaches line the beckoning turquoise waters. Maria la Gorda, a port only accommodating smaller vessels, is part of the Western Cuban province of Pinar del Rio; known as a scuba diver’s paradise. The port’s lush landscape is home to native birds and animals. The shimmering, aqua colored waters welcome experienced and beginner divers, as well as snorkelers. Authentic Cuban Mojitos and fresh seafood are served along the beachfront. Experiencing Cuba’s sunset should be at the top of your “to do” list. The second largest city in Cuba was founded in the 1500’s by Spanish conquistadors. Like many cities of the Caribbean, Santiago de Cuba was fought over by both France and England. The Cuban Revolution actually began in this city in 1953 when the Moncada barracks were attacked by Castro-backed rebels. The city is home to the citadel of San Pedro de la Roca, a UNESCO World Heritage site. Rum lovers take note; the Bacardi liquor brand was founded in Santiago de Cubac. The small, island nation, which remains inaccessible to many, is a land brimming with curiosities, hosting experiences of culture, history and personal enrichment. 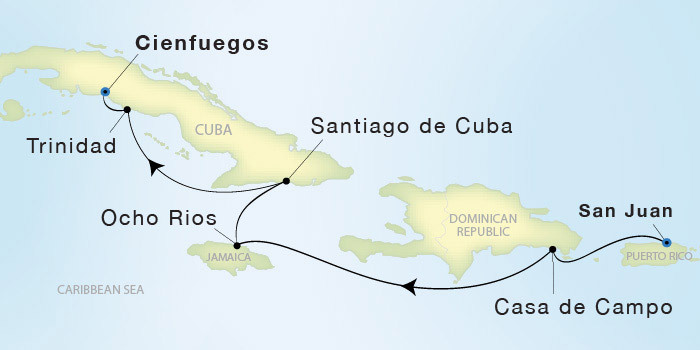 SeaDream’s Cuba voyages will navigate the island from Havana to Cienfuegos, with stops in some of the country’s most storied and least-traveled ports. For your travel convenience, SeaDream will make Havana to Cienfuegos, and Cienfuegos to Havana ground transfer options available for purchase starting Fall 2017. Please contact your Travel Professional or Contact SeaDream for more information. A: Ground travel time is about 3 – 3.5 hours. Flights arriving on the day of Embarkation; should arrive into Havana or Cienfuegos, no later than 12 noon. Flights departing on the day of Debarkation; should depart Havana or Cienfuegos, not before 12 noon. A: Travel to Cuba by citizens of the United States remains restricted. SeaDream’s Cuba program meets certain specific requirements for exemption from this restriction, but only under specific conditions. In general, US citizens must participate in government approved cultural, historical and person-to-person activities on a daily basis when in a Cuban port. These required Land Adventures are included with all guests voyage fare. Our Cuba Land Adventures are undergoing special development, to meet the high expectations of SeaDream and our guests. We have published those Land Adventures that are included with our voyage fare and meet the specific requirements for US Citizens. Additional options will be added shortly. Travel to Cuba by citizens of the United States remains restricted. SeaDream’s Cuba program meets certain specific requirements for exemption from this restriction, but only under specific conditions. In general, US Citizens must participate in government approved cultural, historical, and person to person activities on a daily basis when in a Cuban port. This requirement will be built into our land adventures program, and a select land adventure will be included for all guests in each Cuban port. As always, a valid passport is required for travel for all guests, and visas for some may be required. Other travel requirements may apply. Please view the FAQ section. Once booked, we will recommend that guests of all nationalities contact their appropriate government agency or a professional visa service regarding any additional requirements that may be needed for travel to Cuba.